4.2 out of 5 based on 197 bloggers and 27 commenters. 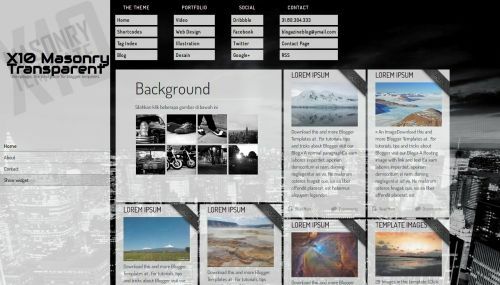 X10 Masonry Transparent is a free blogger template with 2 columns, magazine-styled, left sidebar, gallery-styled, an exclusive design for Blogger, posts thumbnails, well designed threaded comments and girly looking. Excellent template for blogs about culture, music, people or photography. This is indeed one of the best blogger templates on offer. awesome job. But colour is not fine in this template. i´m so unlucky maybe someone can help me, i alway get a SyntaxError while i´m installing this, mabe anyone an idea. at my testblog it works but not at my blog. but how I Xml to html????? i hopeful this your blog can be better………. i like your blog a lot……. very cool template! one question though, any suggestions where i can place the advertisement banner in this template aside from the widgets? if possible, can the banners be readily seen in the page? thanks! i want templete flash good,give me! i want to keep the blogger widgets in default view. at present widgets shows after clicking on view widgets link..
can some one help me with the change of code..
and also i want to remove the show widget button. Can someone explain to me, how can i make the Background work? I have to paste tw different pictures – one big and one as a thumbnail? Where is html code of this template ? any one please suggest me the tamplets which can use for amazon “astore” coding ready. Hello Guys, I really liked this blog template but I would like to make tiny changes to it. Please let me know if I can download this template and customize it without breaching copyright licensing issues. I would be having the credits section as it is but do not want to fall into any legal issues. Please help me here.